Tens of thousands of people on sickness benefits will receive backdated payments averaging £5,000 following government errors. The Department for Work and Pensions (DWP) has revealed it is paying more than £1.5bn due to the mistakes. Some people have already received payouts of more than £10,000. The mistaken calculations were made when people were moved on to the main sickness benefit, the Employment and Support Allowance (ESA). The errors were first revealed by BBC News in November, but the scale of the underpayments has now emerged. Philip Stanton, 58, got a letter earlier this year about the backdated payments, followed by a cheque for £2,250 in July. "You feel brilliant at first because when you're living on £73 a week, that's a heck of a lot of money - though of course it won't last forever," he told BBC News. "But then you think, 'what if they hadn't found out? What else is there?'. I have no idea how it was worked out or even if it's the right amount." Mr Stanton, who has been receiving sickness benefits "on and off for 10 years", has anxiety and depression as well as problems with his back. He said he was told his payment went back to 2014. "A couple of my friends are in the same situation and one of them got more than me, which is why I thought I would query it," said Mr Stanton, from Northampton. "But someone else hasn't heard anything. "I'm very grateful to get the money, but with my dealings with them, I tend not to trust them." He said he has asked how the payment was calculated and is waiting for a response. 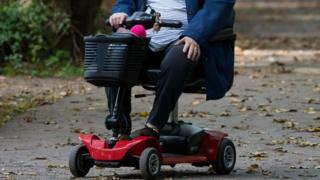 Assessors wrongly calculated the income of thousands of people during the process that resulted in people moving from incapacity benefit and severe disability allowance onto ESA. Most of the errors occurred between 2011 and 2014. In a newly published document, the DWP said: "We estimate that around 180,000 people could be owed arrears payments, with around 105,000 estimated to be repaid during 2018-19 and 75,000 during 2019-20." The government had previously said that all the backdated payments would be completed by April 2019. The DWP said that the backdated payments totalled £970m. It now also faced a larger bill for ongoing ESA awards, costing the department more than £700m extra until 2024-25, bringing the total cost to £1.67bn. Frank Field, who chairs the Commons Work and Pensions Committee, said: "It is welcome news that the government is finally making progress towards repaying people who have missed out on ESA. "Its best estimate is that it owes claimants £970m - but the final bill could be even higher. The government must learn lessons from this appalling failure, as it faces the much bigger challenge of moving people onto Universal Credit." The government has 400 people working on claims, with the priority on those who are terminally ill. Around 18,000 arrears payments have already been made totalling £120m. The average payment so far is about £7,000. The government's original decision to only backdate payments to 2014 was legally challenged by the Child Poverty Action Group. CPAG chief executive Alison Garnham said it was good news that 180,000 people would now receive backdated compensation, but said "it should concern us all that [the DWP] so significantly underestimated the number of people affected". She added: "It should not have taken legal action to get vulnerable people the money they were entitled to from the outset to avoid hardship." In a statement, the DWP said: "Anyone affected by this historic error will receive all of the money they are entitled to. "We have worked with charities and other disability organisations to make sure that we are providing the right support to all affected claimants and are hiring and allocating more staff to do that." Labour introduced ESA in 2008, claiming the change would move a million people off sickness benefit and save the Treasury £7bn. The shift from incapacity benefits to ESA was then accelerated by the coalition government. The payments have come to light in a week when the government has faced severe criticism for its flagship welfare reform, Universal Credit. On Tuesday, BBC News revealed that ministers were further delaying the rollout of the system, which merges six benefits into one.